Springtime… what a beautiful season, with grass growing green again and a pile of books on my desk waiting to be appreciated. I want to go outside, hike, drink spring water, sit on a bench, and read from my Kindle. That’s a plan. Happy reading in March! This is my March 2019 page to write about what I’m reading. So far I’ve finished 11 books for the 2019 PopSugar Reading Challenge. I’ve read a few other books too, as some don’t fit on the PopSugar list. Here are seven steps that will help creativity seekers along on the path to increased skill development and productivity. Today I noticed that Goodreads has declared this to be “Romance Week” so I followed their links to a page naming the Top 100 Romance Novels on Goodreads. I don’t normally read romance novels, so out of 100 novels named, I’ve read only 7 of them, and of those, 4 were classics. This is my February 2019 page to report on what I’m reading, and the progress I’m making on my literary adventure as the month wears on. There’s a diary-type feature after the books are listed. I just love book lists – almost as much as I love books themselves. I got this book list from a Goodreads group with the same name as the list. So . . . thought I’d put the list on my blog here to keep track of which books I’ve actually read, and we’ll see how many I get to read before . . . . that morbid thing happens. Hi there… thought I’d try something new for 2019 … a monthly reading report. Not sure what I’m doing here but at least I’m doing something, right? The topic is . . . books!!! Why not… this is a book blog, after all. My plan for reading this year is to stay close to the plan I already made for the 2019 PopSugar Reading Challenge. That will provide for a lot of diversity in my reading as I’ll be exposed to genres I wouldn’t otherwise pick up to read. I will also have other books to read, because not everything is covered in that challenge. Every year is different. Every year changes life. Sometimes the changes are beyond what you expect. Goals and plans rarely work out. Resolutions are broken. Life takes on unexpected realities. We adjust. I’m doing the PopSugar Reading Challenge again in 2019! I won’t start reading the books on this list until January but I’m already choosing books for the 2019 version of the challenge. Updated . . . Once again, for the third year in a row, I’m participating in the PopSugar Reading Challenge. My art is classified as folk art. One definition I found for folk art is – art done by people who are not trained as artists. I’m not sure all folk artists are untrained, but for me, that is, for the most part, true. I took a few art classes in high school and college, but since then, nothing. I spent most of my life taking care of my children and that precluded creating a lot of art. Lina – the story of a 14-year-old girl living in the foothills of the Himalayas around the year 1300. She’s escaping a bad situation. To get some variety back into this blog, I’m going to start writing in all the categories – journal, fiction, art, the art of writing, book reviews, and lists/challenges. Today I’ll start by writing about what’s happening in my life, as of March 2018. Please subscribe to my channels – that would help a lot! Thanks to all subscribers! Hi, I'm Linda, the Book Lady, and I'm excited about reading. A book is a gift you give yourself. It is so much fun to open that cover and discover what was hidden within. Books share the wisdom of the ages with us. Who wouldn't want that? So I read frequently and encourage reading. If you're a reader, let me know by becoming my friend on GoodReads. 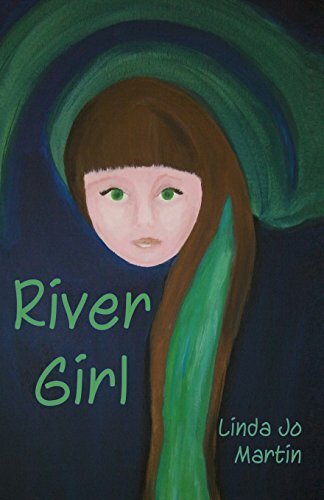 My novel, River Girl, is for ages 8 to 15. I use Amazon affiliate links on this site and appreciate it very much when you purchase from my links. I also use a few other affiliate links - such as PicMonkey... a great graphics program I subscribe to. Visit Linda Jo Martin, Book Lady's profile on Pinterest. I love Scrivener, and use it for all my writing. It is a fantastic writing software that organizes a novel, ebook, or screenplay efficiently while I write and revise.